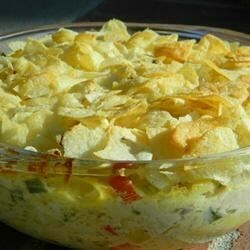 "This delicious casserole is for leftover leftovers. I don't know about you, but after a few days of eating Thanksgiving leftovers, no matter how tasty they originally were, I want something that makes me forget there's even turkey in it. Since ingredients like garam masala, spicy cheese, and peppers aren't typically used in the meal, they work wonderfully here to disguise the last of a holiday bird." Pour milk into butter and flour mixture, whisking constantly. Stir in cream of mushroom soup, red bell pepper, green bell pepper, green onions, garam masala, and dried tarragon. Bring mixture to a simmer, cook for 2 minutes. Remove from heat. Stir pepperjack cheese mixture, turkey meat, and noodles in a large bowl until evenly incorporated. Pour mixture into a large casserole dish. Sprinkle chips on top, pressing down slightly with the tines of a fork. Bake in the preheated oven until casserole top is golden brown and sauce is bubbling, about 30 minutes. See how to make this classic casserole starring leftover Thanksgiving turkey. My only deviation was using Monterey Jack cheese, as I'm not fond of Pepper Jack. For us, the garam masala and tarragon didn't work with this dish. It was OK but wouldn't make it again. Yum! Not only was it simple to put together, but I loved the video directions from Food Wishes!